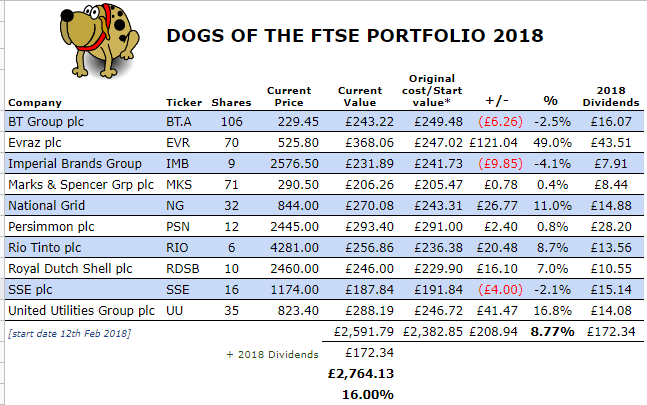 This entry was posted in Dogs of FTSE, Selling, Shares by weenie. Bookmark the permalink. Wow, that is an impressive performance! Especially considering the poor performance of the FTSE100 index. Which ISA provider have you been using? I currently just use Vanguard. They’re good because they’re cheap, but you can only buy Vanguard funds, which means I can’t try fun looking things like this (which is probably a blessing in disguise as, in my case, I’d probably start tinkering with the portfolio too much!). I know, I wasn’t expecting them to do this well at all! It didn’t go so well last year and I thought it was going to be more of the same! I’m currently using AJ Bell Youinvest for this experiment – cost is £1.50 to purchase but £9.95 to sell. I’m waiting til the next tax year because by then, I should have access to the Freetrade app (https://freetrade.io/), where purchases and sales will be free. I wasn’t only planning on investing so much on a mere experiment but had to account for the fees. Zero fees will mean the optimum medium for this experiment! I will be doing a Freetrade app review once I’ve got my mitts on it! iWeb is a good cheap platform; owned by the Halifax, so has that reassurance. £25 initial fee, and then £5/trade. Only thing you have to watch out for is that if you open an ISA, it automatically opens a share dealing a/c as well (and that can’t be deleted), so you have to double-check you’re in the right account before transferring money or buying shares (they are quite good at sorting out errors, though). I did consider iWeb as an ISA provider but AJ Bell worked out marginally cheaper for my main portfolio, something like £48 vs £60 a year. Yes, it depends how frequently you trade; I don’t trade monthly, so it’s cheaper for me. I resurrected an old IPhone to take a look at Freetrade. A lot of work to be done but pretty good. Same boat as yourself – waiting for the Android version / 2019 ISA. I had a peak of it as my boss has downloaded it, looks great already but as you say, still a lot of work to be done. Make sure your version of Android is 7 or more to be able to run the app! Oh good work! I’ve always had a warm spot for high dividend stocks. It’s why I’ve always had a draw to high yield portfolios. I reckon it’s the traditionalist in me that somehow feels that the point of a company is to make money. I know all of the theoretical and empirical reasons why just looking at dividends in problematic but there it is. Looking forward to see how you do in 2019! Agree that the underlying point is to make money, particularly if there are investors/shareholders, no matter what they say. Not sure I’d have the stomach to invest much more than what I’m experimenting with, although when I’m making the gains like this, I wish I had, haha! Well you can’t say the dogs were all bark and no bite in 2018! Nice! These were pedigree mutts, I think haha! Agree myself that it’s fascinating as an experiment and the strategy strips away all emotion from investing. Jesus, well done! See, it’s an easy strategy to follow and it has beaten the market and many of the so called financial experts. May I ask you where did you hear about this strategy for the first time? I first came across the strategy when one of the participants in my Monkey Stocks league used the strategy and ended up winning the league! The idea originated in the US, in that case, the Dogs of the Dow, with the UK equivalent being Dogs of the FTSE. I leave out any stocks I already have in my portfolio and any which have declared a cut in dividend. Ordinarily, I would have sold the ones no longer in the top ten and replaced with new ones (as it has been a year), but as mentioned, I am waiting until the next tax year.